The new issue of pop culture bible Entertainment Weekly just ‘hits the stands’ in the States (as well as a few of the fancier newsagents in Central London) and it’s rammed full of previews in honour of this week’s annual San Diego Comic-Con. 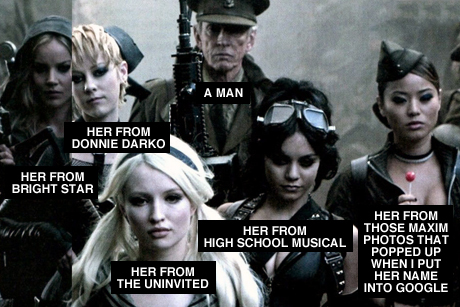 Above you can see the first official photo from Zack Snyder’s forthcoming violent fantasy thing Sucker Punch, which features a largely female cast and is set in some kind of semi-hallucinated 50s mental institution. As you / might / remember, I’m not the biggest fan of ‘first official photos’ but I thought this one was worth posting because only yesterday I was bemoaning the absence of Jena Malone in 2010’s Hollywood, and today here she is: slap bang in the middle of one of the most hyped movies going. Nice to see Abbie Cornish and Emily Browning finally punching their way into the A-list too. Say what you like about Zach Snyder, but he can pull just about any old fucker out of obscurity.